n addition to predicting the continuation of the trend, triangle patterns also forecast short-term price objectives. Discover how to put this common pattern to work for you. 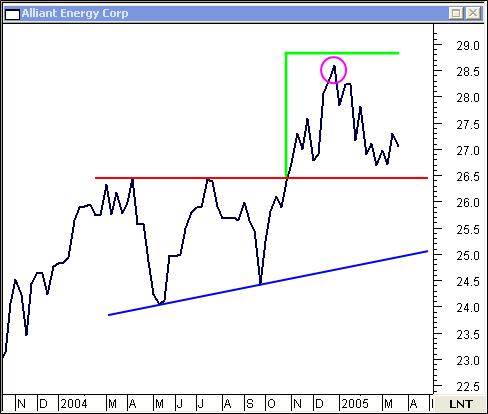 Price broke-out of an ascending triangle on this weekly chart of Alliant Energy Corp... just missing the projected price target. 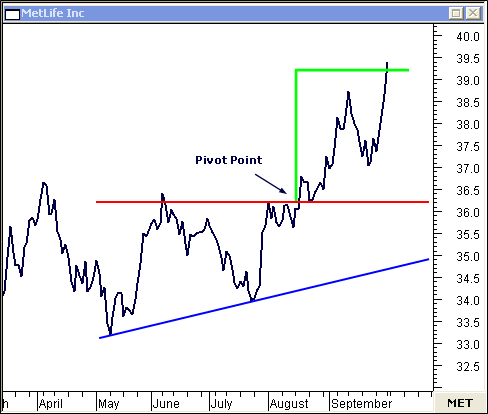 This daily chart of MetLife Inc shows how the break-out from the ascending triangle becomes the pivot point for support and resistance. Not only can triangle patterns forecast price targets, but, by using the triangle's apex as a reference point, you can predict possible price turning points. 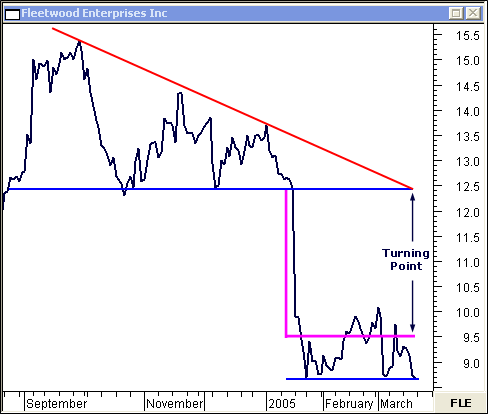 The descending triangle price objective was easily met on this daily chart of Fleetwood Enterprises Inc.
And... the apex of the triangle marks a possible reversal point -- where the price may bounce on solid support. The down-side price objective was doubled on this weekly chart of Eli Lilly and Co. Note how price reversed at the apex of the descending triangle. 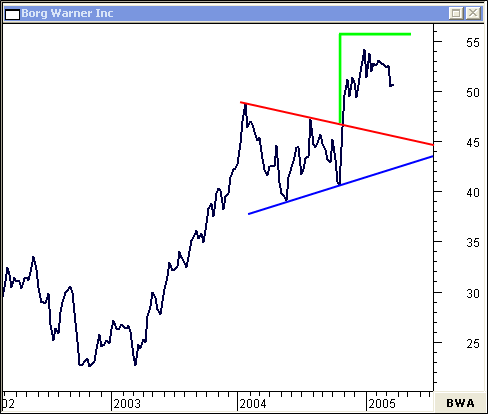 There's no doubt which way the price is headed on this weekly chart of Borg Warner Inc. 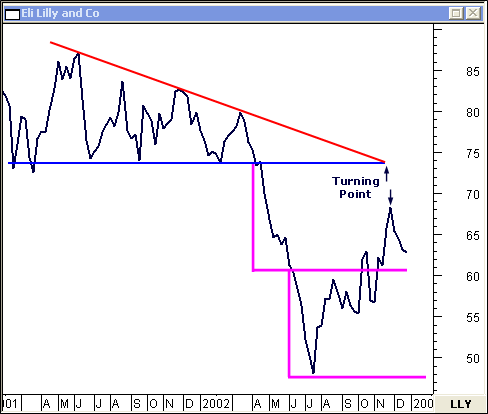 Although the symmetrical triangle price objective has not been met, neither has the apex turning point objective. There is still time for both targets to materialize. 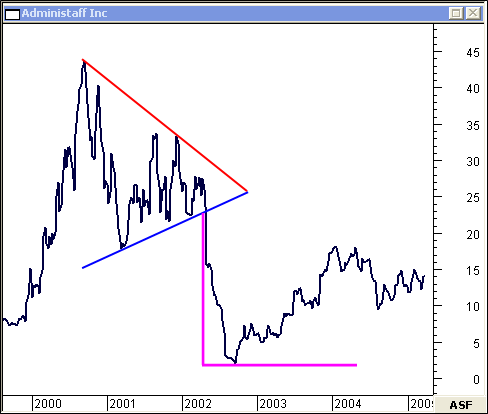 This weekly chart of Administaff Inc shows typical price action after a symmetrical triangle break-out... volatile and decisive. Don't be on the wrong side of this trade!